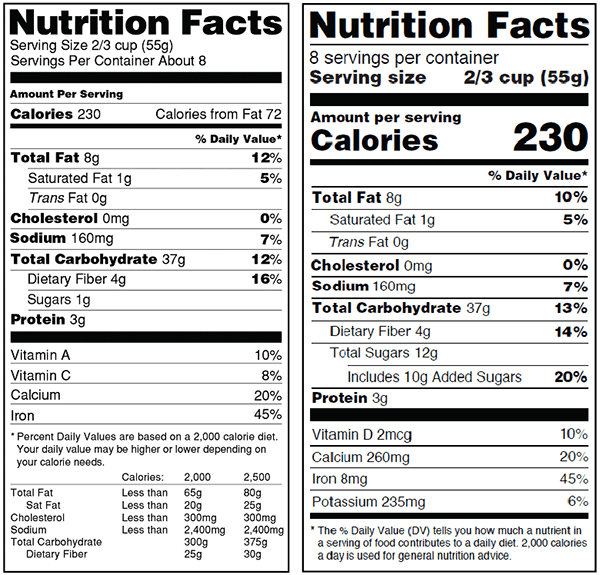 Last week, the FDA finalized the new look of the Nutrition Facts label. 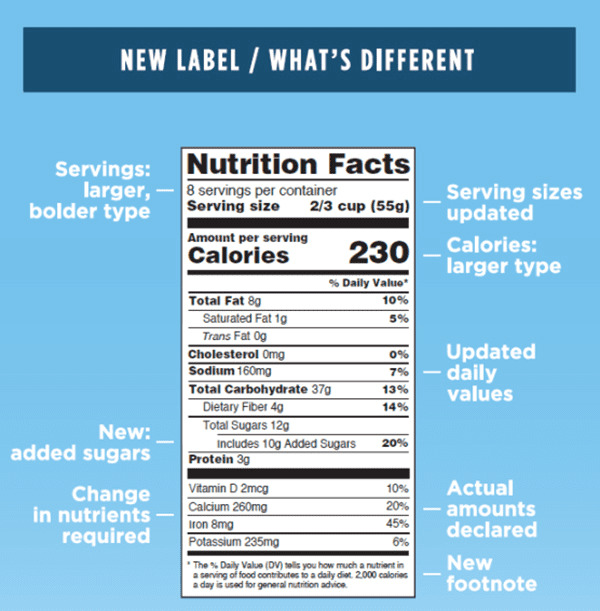 At first glance, the updated nutrition labels might not look wildly different—aside from that jumbo-sized font on the calorie count, which seems like it’s yelling at us like the National Weather Service used to do — but there are a few key differences. Fat gets its name cleared. Now that we know fat isn’t inherently evil, “Calories from Fat” will no longer be listed next to the total calorie count per serving. This is good news for foods like guacamole, which gets 75 to 80 percent of its calories from the heart-healthy fat found in avocados. (Total fat, trans fat, and saturated fat will still be listed separately. Serving sizes are getting a reality check. Many serving sizes will be increased to reflect typical eating habits (whether or not that portion size is appropriate is an entirely different matter). For instance, on the new nutrition label design, 12 and 20 ounce bottles of sodas will now each be calculated as one serving, pints of ice cream will be reduced from four servings to three, and yogurt serving sizes will drop from eight ounces to six ounces. Added sugars are getting singled out. A banana has more sugar than a bowl of fruity Day-Glo cereal, but you can probably guess which is healthier. Foods with added sweeteners — like corn syrup, honey, or agave — are typically high in calories but pull little weight in the nutrient department. The new Dietary Guidelines caution against getting more than 10 percent of your daily calories from added sugars, and the new labels will list these sneaky sugars separately. Key nutrients will be listed differently. One word of caution: Manufacturers have until July 26, 2018 to make the required changes, and smaller companies will get an extra year. Until then, continue to keep a close eye on your serving sizes, scan the ingredients for hidden sugars, and use your common sense to interpret the current labels and find healthy, nutrient-rich options.